Read Tuesday – Discounted books! Tomorrow is Read Tuesday, an initiative where indie writers offer their books at a discount in order to get people reading. I am participating in this event, and both my books have been discounted to $0.99 today, tomorrow and Wednesday. For the full catalogue of discounted books, go visit the Read Tuesday webpage. The link to the full catalogue is at the top, my books are under the Mature category. This entry was posted in News & Random Stuff and tagged Books, cheap books, discount, Fantasy, indie authors, Read Tuesday, Romance, Self-publishing, The Conspiracy, The Ritual on December 9, 2013 by Erica Dakin. Last week I posted the Epilogue of my Tolkien crossover fanfic A Shire Romance, and with that it was finished. As the blurb for it says, this was the very first novel I actually completed (I’ve written craploads of unfinished stuff before it), and while I know it has shedloads of flaws, as a story in itself I quite like it, hence my decision to post it in episode format. This entry was posted in A Shire Romance, Stories and tagged A Shire Romance, Fantasy, Middle-Earth, Peregrin Took, Perry, Tamsyn, The Shire, Tolkien on December 5, 2013 by Erica Dakin. Enough of the vampires already! So, technically I should have done this post yesterday, since I no longer have competitions and readalongs to keep me busy on Mondays, but I got distracted. Back to the usual schedule next week, hopefully. Today I’m on part nine of my 26 Week Book Challenge, not counting my two interludes of contraryness. In the process I may have potentially pissed off part of my audience by slagging off Fifty Shades of Grey, but just in case I haven’t I’m going to try again by giving you a book I hated. This entry was posted in Book stuff and tagged 26WBC, Author, Bella Swan, Books, Edward Cullen, hate, Stephenie Meyer, Twilight on December 3, 2013 by Erica Dakin. Why: Someone compared my book to this, so I was curious. Description: About to be executed for murder, Yelena is offered an extraordinary reprieve. She’ll eat the best meals, have rooms in the palace—and risk assassination by anyone trying to kill the Commander of Ixia. 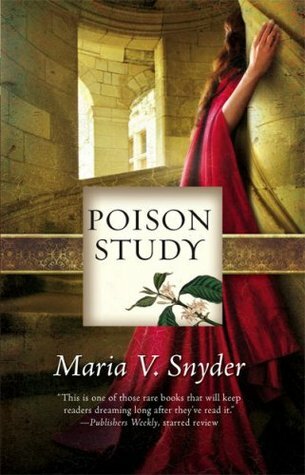 This entry was posted in Reviews and tagged Books, Fantasy, Maria V Snyder, Poison Study, Review, Reviews, Silk Screen Views, Three stars, Valek, Yelena on December 2, 2013 by Erica Dakin.